Botanica's Summer Open House will take place July 16th from 4-8pm. Contact 727-441-1711 for more info or to book an appointment. 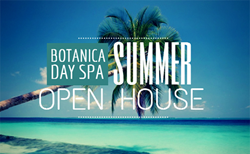 Botanica Day Spa announced this week that their 2014 Summer Open House event will be held at the day spa, located in down town Clearwater, FL on July 16th from 4-8 p.m. Wine and other refreshments will be served as clients are invited to take advantage of great deals on spa services as well as retail beauty product discounts. Appointment openings are limited, so clients are encouraged to call and reserve a spot quickly. “We love hosting special events like this and creating a relaxing, fun ambiance for our clients,” said Gen Obolensky, owner at Botanica Day Spa and an aesthetician herself. “So many of our customers are like family to us, and we look forward to seeing everyone come in for some pampering. It’s exciting for our whole beauty team because we really love our clients,” she added. The iconic Clearwater spa, best known for their annual Fall Open House event which takes place every November, celebrates its twentieth year in business in 2014. Obolensky added that an Anniversary event is in the works for the occasion. Visit the Botanica Day Spa website to learn more about all the special offers and discounts that will be offered at this year’s Summer Open House. To make an appointment, call 727-441-1711 or take advantage of the spa’s convenient online booking feature. Appointments are expected to fill up quickly for this event, so act fast!